At Urban Initiatives, soccer is not the only component that makes up our Work to Play Program. Each week head coaches lead discussions covering a variety of different character development and health & wellness topics. 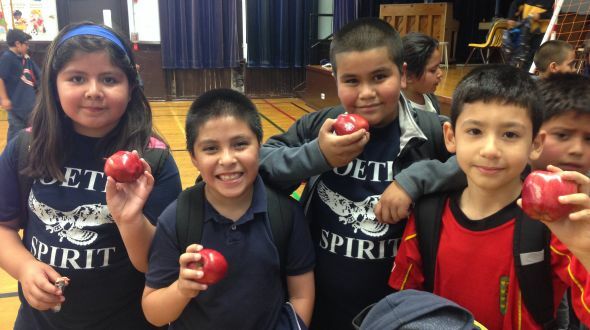 For week 6 of the Work to Play Program, we discuss the importance of eating healthy. During practices last week at Reavis, Tarkington, Ward, PECS and Marquette OSPD’s educate their players about the 5 main food groups; fruits, vegetables, grains, dairy, and protein, with the driving focus behind the discussion being: in order to be healthy, one must have a well balanced diet from those 5 main food groups. They learned that eating healthy would not only help them perform on the field, but in the classroom as well. One point of emphasis for the players to understand was that having a healthy diet doesn’t simply mean eating fruits and vegetables, but rather, the focus should be on being well balanced. It’s important to have a well balanced diet consisting of foods from the 5 main food groups, as each provides different types of vitamins, minerals and nutrients for their bodies to help them stay healthy. Coach Ellinger at PECS also offered up a challenge to their players: plan 2 days of healthy meals for the week with their parents by making menus for breakfast, lunch, and dinner that included all of the 5 essential food groups. With Halloween just around the corner, and kids getting ready to load up on candy, Coach Berger felt it was important for soccer players to understand that eating foods with a lot of salts, fats, and sugars weren’t, and aren’t, terrible for them as long as they are had in moderation. It becomes harmful to their bodies when too much of said food, or too much of one food group for that matter, is consumed. “Instead of having a glass of soda, why not have a glass of water?” said Coach Gonzalez at Marquette. Instead of grabbing a bag of chips for their lunch, why not grab some fruit? The aim is to not only equip our kids with the knowledge to make healthier choices, but to help them realize that the more healthy their food choices are, the more healthy their life will be. Previous Article: National Teachers Academy, Work to Play’s Newest School!